If you're a long time reader of VH, then you all know by now that I hate mice. Literally, I just don't use mice, I don't personally review mice, nor do I get excited by a mouse. I am however completely addicted to my thumb controlled trackball. Way back in the day, I would paint my white Logitech trackman to match my case. Then I got the Microsoft Trackball for a bit, until they stopped making it. Then I went back to the newer Logitech Trackman wheel . However there is always one thing that was missing; a decent wireless version. That is, until now! Enter the Logitech Wireless Trackball M570 With Leave-in USB Receiver . I was so excited to get this new product that I could barely contain myself. Check out all the features and Specs on the Logitech website here. The Logitech Wireless Trackball M570 With Leave-in USB Receiver came in the typical Logitech packaging which they have used for a while now, and there is absolutely nothing wrong with it. I've purchased many Logitech products over the years, but usually there was a lot more inside! This time there was just the trackball, a tiny(!) receiver and a manual. No cord and it's about damn time! I still can't get over how tiny this receiver is. I love it! Not only did Logitech remove the wires with the new Trackball M570 , they also slightly re-sculpted the design just a bit. Smoothed some edges, etc. Not to mention turning the trackball itself from red to blue. The battery comparment and on/off switch is easy to get to and the four rubber feet make for a very secure grip on any flat surface. Plug it. Forget it. Add to it. 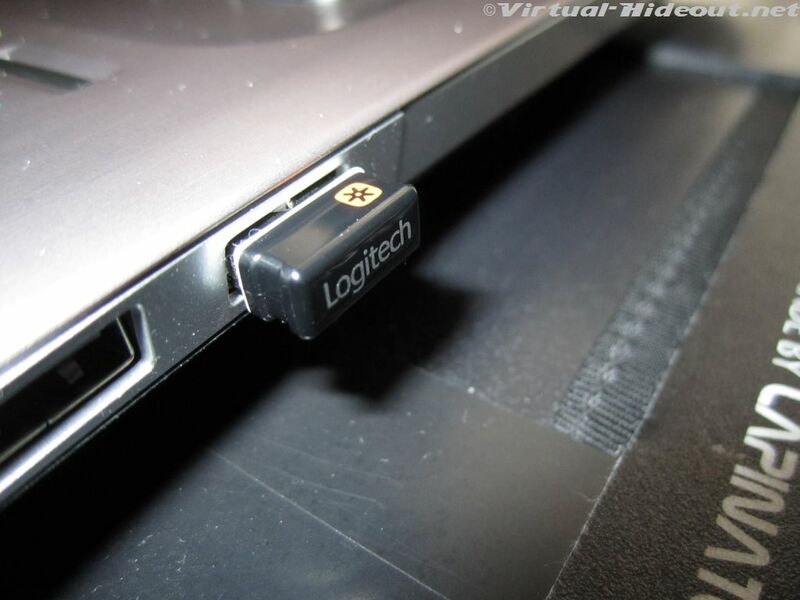 You’ve got the Logitech® Unifying receiver. The Unifying receiver stays in your notebook, so there’s no need to unplug it when you move around. It’s so tiny, you won’t need to worry about the receiver breaking off or getting lost. It's seriously cool to not have bulky cables anymore with my trackball. 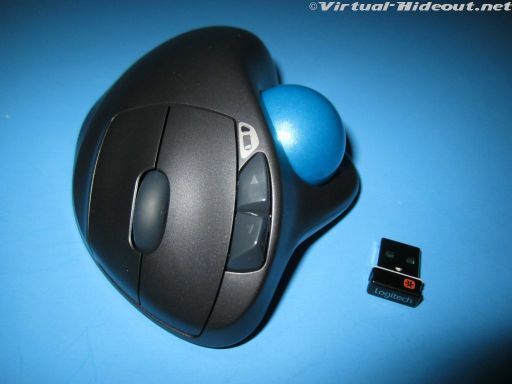 Sure this technology has been around for awhile with high performance mice, but not for trackballs. As you can see by the pictures above, the new Logitech Wireless Trackball M570 With Leave-in USB Receiver has really cleaned up my wired mess with the older trackman wheel. It used to be such a pain for me. I had to tie up the excess cord in an attempt to stop it from grabbing on things when I moved my Lapinator Plus around. It's also great not to be restrained to the computer so much. 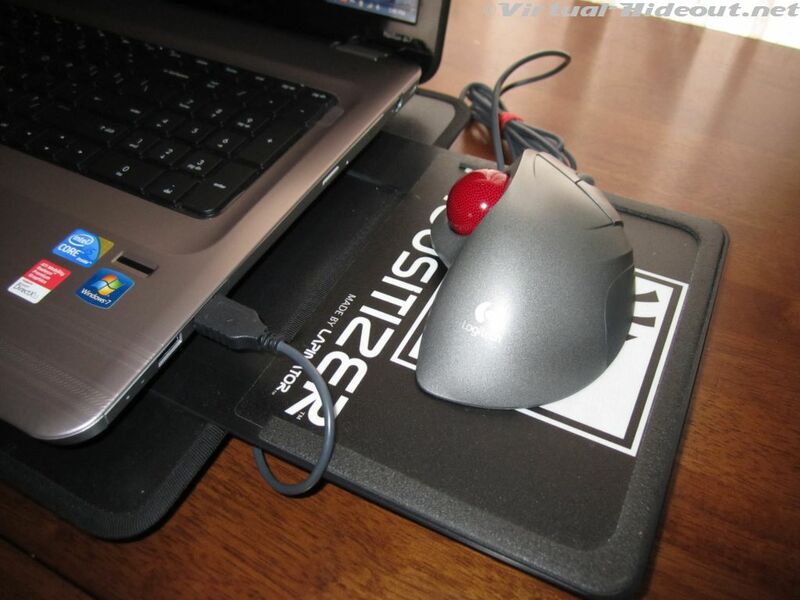 Now I can put the trackball in whatever is the most comfortable for me. As for the performance of this new wireless version, I didn't notice any lag what-so-ever. It has been exceptionally easy to use. In fact I've played lots of Quake Live online with perfect results. Being a 2.4Ghz wireless, the connection is invisible and instantaneous. Also no need for line-of-sight usage. 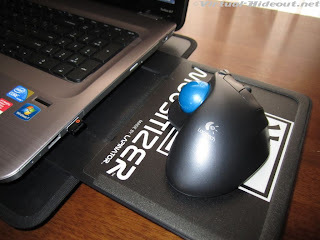 You can put the receiver on the opposite side of your computer, or use the mouse on your lap without being in direct sight of the receiver, so no worries there. Honestly, it works so well, that I will eventually replace all my trackballs with this one. As it is now, My wife and I already have two in the house. What I do personally, since I use it with my HP DV7T notebook, when I'm done using the laptop, I close the lid, then shut off the trackball. What that does, besides saving a bit of battery, is not wake up my laptop when the trackball gets jarred around. I never take the USB receiver out of the notebook. No need to. It's so small, it's almost invisible. Logitech claims the battery will last up to 18 months on a single AA battery. I guess we'll see, but I believe it will last a long, long while. The inclusion of a battery meter on top of the trackball is a nice touch as well. Never have it die on you unexpectedly! Oh yea, the two programmable buttons near the battery meter are setup by default as "back" and "forward" buttons for web browsing and I tell you what, they work great in that capacity. It really speeds up long web browsing sessions by eliminating the need to move the cursor all the way to the top left of the browser to back up or go forward. Now with a twitch of the finger you can go back and forth. Good stuff. The new Logitech Wireless Trackball M570 With Leave-in USB Receiver is exactly the product that I have literally been waiting years for. Many years. 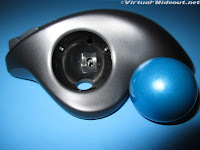 If you're a thumb ball trackball user like me, you've probably stopped reading this and are already ordering this, and if so, I'll forgive you because you should be! This thing is awesome! For a retail price of $59.99, it's a decent deal. However real world pricing is even better, about $44.99 from places like Amazon.com . The real improvement is the wireless ability with the tiny USB receiver. 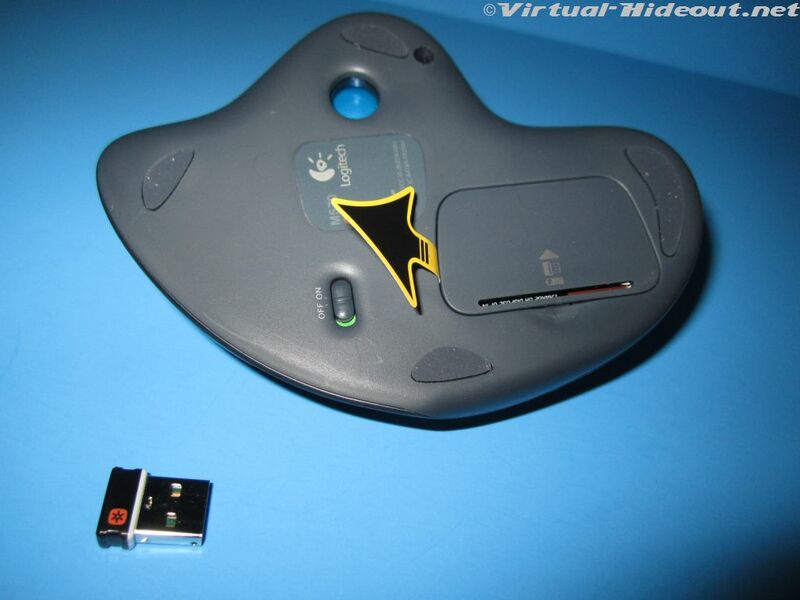 Logitech has had a cordless version of their trackman wheel for years, but it was pointless unless you were using it on a large desktop because it had a massive (corded!) receiver. They finally did wireless right with this new design and as I hear, it's selling like hotcakes and for good reason. They made it prettier, kept it very comfortable to use, made it truly wireless, and kept it's performance optical and top notch. 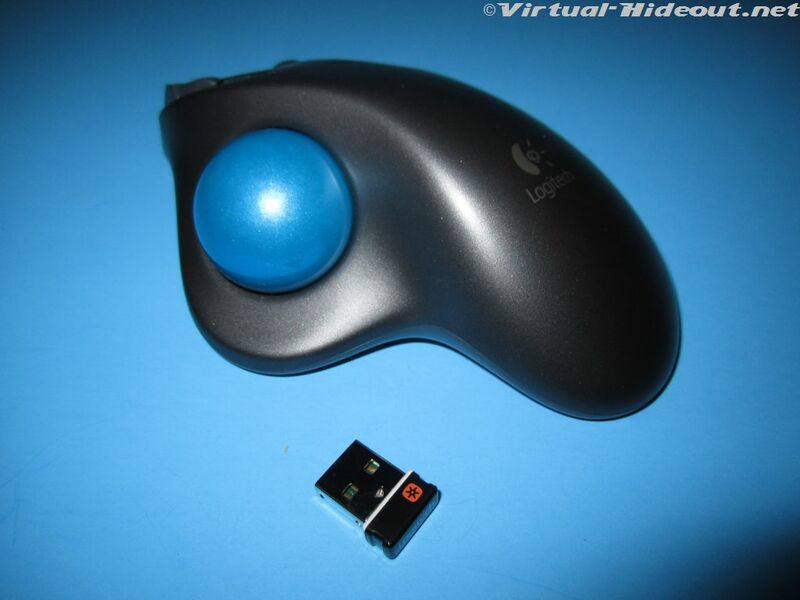 I can't recommend the new Logitech Wireless Trackball M570 With Leave-in USB Receiver enough. I love it! A big thanks to Logitech for continuing to innovate in the trackball sector, even though as of right now, they really have no competition. 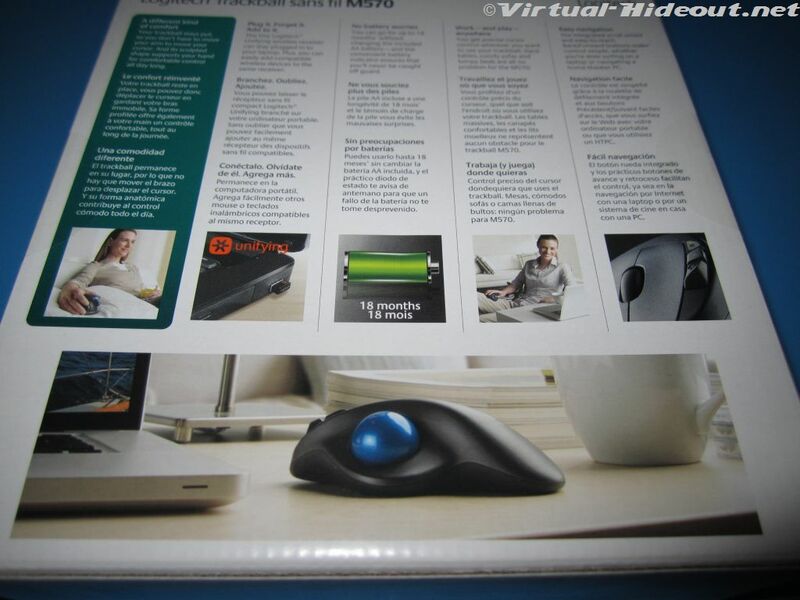 However what they do have, is millions of trackball users that are jumping for joy now. On behalf of them all, I thank you. I also thank logitech for finally updating this line! my corded ones were all dieing :) I bought 3 the week these came out to replace my aging ones, I Love them!! started using their original trackman back in '98 or so.. not sure how people use mice.. especially for FPS games.. trackball is so much easier and faster. I totally agree! Logitech FTW! I would think a trackball would be less precise and slower for aiming than a mouse. Where's all the gamers lining up to buy trackballs? Oh yeah... they aren't. I can't wait to get mine! I am an avid gamer and hovered around trackballs for a while but never touched one. I just ordered mine today! Moving away from my (cumbersome) Microsoft Sidewinder X8 mouse. I am eager to see what this will bring me :D.
Btw: No wireless lag on WiFi like with the MX Revolution Mouse? I have one and the lag makes it terrible to use. Im using one of these as the right hand part of a gaming rig and love it. If i do ill probably modify mine to use an AC power supply. 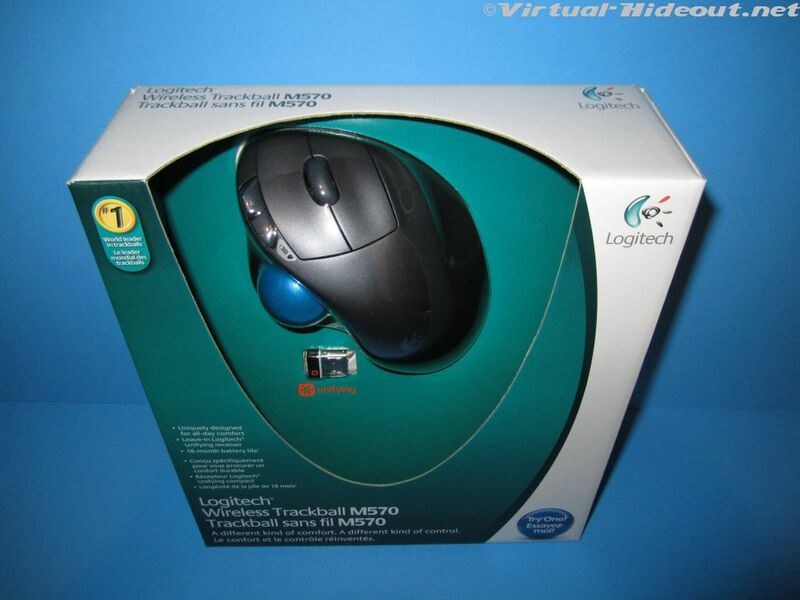 Logitech is a client of ours and would love to hear more about how you use your Wireless Trackball M570. Please email me Lisa (at) channelmavenconsulting (dot) com and tell me how you're using your Trackball M570 i.e. business, travel, gaming, also when and where is it the most beneficial. Not sure if you've seen a contest Logitech is running, basically if you tell them how you use your Logitech Wireless Trackball M570 for business, you could win product or a trip for 2 to Hawaii. Check it out at http://www.logitech.com/en-us/682/tno-contest. Thanks for the review! I have around 4/5 old trackballs and was kind of scared to upgrade (due to the lag issues). But since they aren't there i'm gonna buy one! I've worn out two of the corded versions. The three little bearings that the roller ball sits on get jammed then quickly develop flats. The action then becomes stiff and jerky. I tried lubricating the bearings, but it didn't help much. It was with sadness that I had to give up and revert to a conventional mouse. I heard that the buttons are loud when clicked. Is that true? I really hate loud mice. I wouldn't say it's loud, but there is a concise audible click. It's no louder than any other mouse I've ever heard. But no, it's not silent. I have been the owner of a multitude of corded thumb trackballs from Logitech. I dread using a regular mouse again (carpel tunnel), but since they got rid of the wired option, the ridiculously poor performance of the M570 is going to force me to switch. It will work fine, and then sporadically get stuck and unable to move, or start to move in jumps and starts. Clicks will register as two clicks. Click and drag will "release" the mouse-button no matter how firmly you are holding it down. This makes games impossible, and regular work frustrating. I bought this mouse to replace a wired version I wore out. I have the receiver no more than a couple feet from the mouse, and have tried it with the drivers active, disabling the Logitech drivers, adjusting OS priority, reinstalling the drivers ... nothing works. My advice? Convince Logitech to bring back the wired version. I would buy a wired one in a heartbeat. The wireless M570? Junk.